October’s 4BPS increase in the national delinquency rate can be directly linked to continued hurricane impact, while delinquencies fell 14BPS in non-affected areas. Though delinquencies were down in all states except Texas and Florida, in FEMA-declared Hurricanes Harvey and Irma disaster areas, they rose another 24 percent (186BPS) in October. The most notable increase was in Florida, where delinquencies spiked 36 percent from September in hurricane-affected areas. Over 229,000 past-due mortgages can now be attributed to Hurricanes Irma (163,000) and Harvey (66,000). Total non-current inventories in Florida and Texas (all loans 30 or more days past due or in foreclosure) have risen 79 and 30 percent, respectively, over the past six months. Prepayment activity rebounded in October, up 17 percent month-over-month, but still 25 percent below last year’s level. The inventory of loans in active foreclosure continues to improve, falling below 350,000 for the first time since 2006. Potential existing-home sales increased to a 5.89 million seasonally adjusted, annualized rate (SAAR), a 0.4 percent month-over-month increase. This represents a 95.7 percent increase from the market potential low point reached in December 2008. In October, the market potential for existing-home sales decreased by 4.3 percent compared with a year ago, a loss of 262,000 (SAAR) sales. Currently, potential existing-home sales is 481,000 (SAAR), or 8.2 percent, below the pre-recession peak of market potential, which occurred in July 2005. The market for existing-home sales is underperforming its potential by 7.7 percent or an estimated 455,000 (SAAR) sales. Market potential increased by an estimated 26,000 (SAAR) sales between September 2017 and October 2017. “Tight supply and strong first-time home buyer demand continue to be the dominant factors driving the current state of the housing market,” said Mark Fleming, chief economist at First American. “Existing homeowners remain reluctant to list their homes for sale for fear of not being able to find a home to buy, keeping supply levels low. “At the same time, a healthy number of potential home buyers continue to enter the market, so house prices are increasing and affordability is declining. Modest economic growth, robust job gains, and low interest rates make for a favorable economic environment for housing and mortgage markets. But despite the favorable environment, housing markets have stalled a bit through summer and into fall. A lack of available for-sale inventory is helping to contribute to an acceleration in home prices. The lack of inventory has been a storyline throughout the summer and fall after a good start to the year. We now anticipate 1.2 million housing starts and 6.13 million home sales for 2017. Despite the disappointing latter half of the year, both numbers are still on track for the best year in a decade. 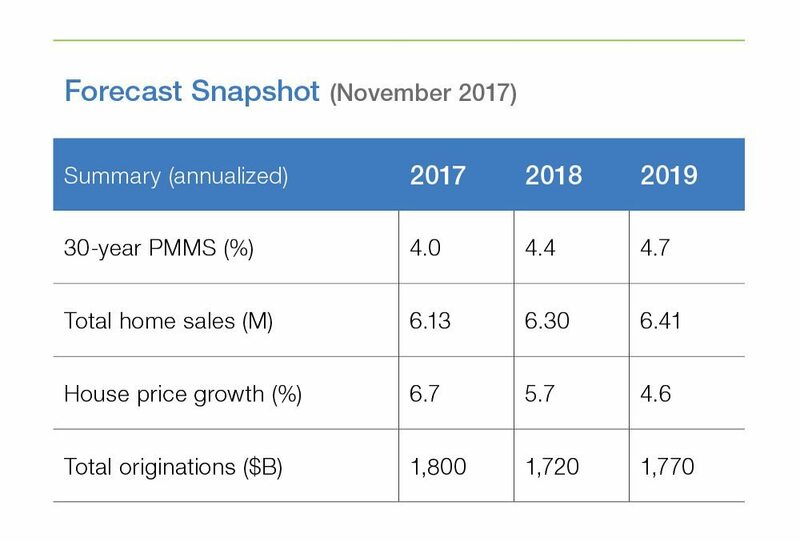 We also expect starts and sales to increase in 2018 and 2019 — thanks to housing construction gradually picking up and helping to supply more homes to inventory-starved markets. Strong demand, low mortgage rates and a lack of for-sale inventory has contributed to accelerating house prices. Nationally, home prices increased at a 6.4 percent annualized rate over the quarter ending September 2017. “It’s unlikely the economic environment will be much more favorable for housing and mortgage markets in 2018 and 2019,” said Sean Becketti, Chief Economist at Freddie Mac. “We forecast that interest rates will remain low by historical standards, but gradually creep higher over the next two years. “We also forecast that housing construction will gradually pick up, helping to supply more homes to inventory-starved markets. More housing supply and modestly higher rates will lead to a moderation in house price growth.